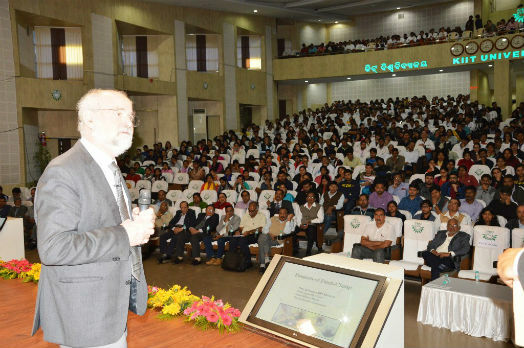 Bhubaneswar: Nobel Laureate Prof. Erwin Neher delivered JBS Haldane Lecture on the topic ‘Ion Channels: Their Discovery and Their Role in Biomedicine and Pharmacology’ at Kalinga Institute of Industrial Technology (KIIT), Deemed to be University on January 8, 2018. The Nobel Laureate explained the ‘Patch Clamp technique’ that he had developed along with his colleague Prof. Bert Sakmann to study ionic currents in individual isolated living cells, tissue sections, or patches of cell membrane. The technique revolutionized the study of ion channels – a kind of pore-forming proteins located in cell membranes that facilitate the passage of ions into and out of the cell and affect the human physiology. Patch clamp technique allows the measurement of incredibly small electrical currents (amounting to a picoampere) that pass through a single ion channel and in the screening and safety evaluation of drugs that are targeted to ion channels in a range of disorders including pain, epilepsy, depression, stroke, bipolar disorder, arrhythmia, hypertension, autoimmune disorders, cystic fibrosis and diabetes, etc. The two German scientists were awarded Nobel Prize in Physiology or Medicine in 1991 for this significant discovery. Prof. Neher elaborated the concepts around ion channels such as the involvement of ion channels in conducting tasks in different cell types like Nerve cell, Kidney cells, Lymphocytes, etc., interest of pharmaceutical industry in ion channels for drug discovery, role of ion channels in heat and cold sensation, the diseases caused due to defect in ion channels, channelopathies in Cardiology and the Patch Clamp Technique. On the occasion, Prof. Erwin Neher was conferred with JBS Haldane Award 2017 by Dr. Achyuta Samanta, Founder, KIIT & KISS in presence of Prof. H. K. Mohanty, VC, KIIT Deemed to be University. KIIT School of Biotechnology has been organizing the Lecture Series in honour of JBS Haldane, a celebrated scientist, since 2013. Nobel Laureates Prof. Oliver J. Smithies, Prof. Ferid Murad, Prof. Jean Marie-Lehn, Prof. Sir John E. Walker, Prof. Ada E. Yonath and other eminent scientists have delivered the lecture in the past. This was the 10th Lecture in the series. “It’s a pleasure to talk about my research and discuss its possibilities with you all in one of the best universities in the country,” Prof. Neher said before a packed auditorium. He discussed in detail the earlier researches done in the area of bio-electricity by scientists like Luigi Galvani, the pioneer of bio-electromagnetic, Santiago Ramon Y Cajal, Spanish neuroscientist and pathologist, and Julius Bernstein, a German Physiologist. Prof. Neher took a few questions related to ion channels and their implications in the field from researchers, faculty members and students present. 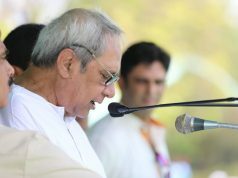 Earlier, Dr. Mrutyunjay Suar, Director, KIIT School of Biotechnology delivered the welcome address.